It’s an unfortunate fact that certain states’ “Stand Your Ground” laws are getting tested more and more these days. In fact, in Florida alone, deaths that are ruled as “justifiable homicides” increased 283% between the time the law was enacted and 2010. This is now a sad reality, but many people would claim that the law is a good one since it allows people to defend themselves when they believe their lives are in danger. Much like the Jim Crow laws of the past, however, “Stand Your Ground” is beginning to look more and more like a racially biased law disguised in the cloak of legal necessity. In what is quickly becoming a rallying call against the racial bias of “Stand Your Ground” laws, a young U.S. airman, Michael Giles, was sentenced to 25 years in a Florida prison after shooting a man, who happened to be attacking him, in the leg. That’s right: no death actually occurred in the incident, but Giles was sentenced to 25 years. What makes this even more disheartening is the fact that, in an unrelated case, a Missouri man only received 20 years for actually murdering a man who was only leaving a residence. The Giles case began when the young man, who had just finished out a second tour in the Middle East, went to a nightclub with his friends. At the club, a fight suddenly broke out outside between 30 to 40 different individuals. The young man was not even part of the fight, but fearing for his safety since he couldn’t find his friends, he retrieved a gun from his vehicle, which he had a concealed carry permit for, placed it in his pocket, and went to find his buddies. While searching for his friends, a stranger came out of nowhere and punched Giles to the ground. This assailant even admitted that he planned on punching the first person that he came upon. In an obvious act of self defense — what “Stand Your Ground” laws are supposedly for — Giles shot his assailant in the leg. Unfortunately, several fragments broke away from the bullet and injured two others. Because an admission from the “victim” saying that he randomly attacked Giles doesn’t prove Giles needed to defend himself. Are “Stand Your Ground” laws rotten to the core? Sadly, Giles isn’t the first to fall victim to a system that seems to pick and choose when it will apply the “Stand your Ground” doctrine. In fact, public outcry occurred when Marissa Alexander, a Florida mother, was sentenced to 20 years for firing a warning shot at her husband after the two had been engaged in a physical altercation. Even worse is the sad realization that there was a history of domestic violence against the woman who was defending herself. Fortunately, she will get a retrial, but when looking at Florida’s statistics related to the law, it’s not promising that a different verdict will be reached. In fact, a recent article listing statistics related to Florida’s “Stand your Ground” law shows some disturbing trends. While around 70% of all individuals who use the defense are exonerated, the numbers prove that the law is more geared to protecting white individuals. This can be seen by the fact that 73% of people who kill an African-American and use the defense are freed. Conversely, only 59% of individuals who invoke the defense after killing a white person get the same treatment. Anyone who isn’t blinded by some form of prejudice would literally have to be mentally defunct to not recognize the Giles case as an open-and-shut instance of “Stand your Ground,” but unfortunately, gun rights advocates aren’t screaming for his release. This task has been left to his parents, who are both veterans, and Americans who are demanding some form of justice. Sadly, Governor Rick Scott is ignoring demands for clemency, and this is even after nearly 80,000 people (as of Feb. 17) have signed a petition demanding action. [+7] - boomerang - 02/18/2014I want the freedom to not worry about my teenage son being shot down by some scardy cat, gun toting, asshat. [+3] - farmerman - 02/19/2014[quote] The Left is just going to have to accept that America is never going to give up our freedom [/quote] " Freedom" is not "License"
[+3] - gungasnake - 02/21/2014That girl in Baltimore who said she's tired of being viewed as prey probably views stand-your-ground as a good idea. In fact, in Florida alone, deaths that are ruled as “justifiable homicides” increased 283% between the time the law was enacted and 2010. No. America is a free nation and its citizens have the right to defend themselves. The Left is just going to have to accept that America is never going to give up our freedom. Anyone who isn’t blinded by some form of prejudice would literally have to be mentally defunct to not recognize the Giles case as an open-and-shut instance of “Stand your Ground,” but unfortunately, gun rights advocates aren’t screaming for his release. I for one have not heard of the case until now. Using his case as a vehicle to attack American freedom might not be fair to him. Perhaps better to just focus on the actual injustice of his case? I want the freedom to not worry about my teenage son being shot down by some scardy cat, gun toting, asshat. **** you and this sort of freedom. I can't wait until humanity goes extinct. Try taking that big mouth to a gunfight. 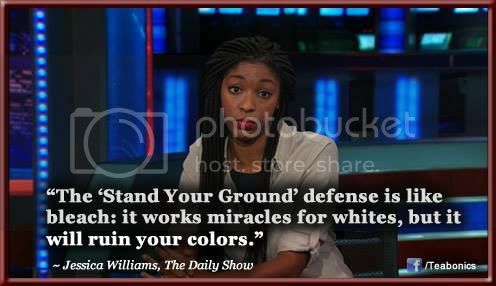 I wonder what can be done about the unfairness of the way the "stand your ground" has seem to have fallen along racial lines? If people protest, it will just be said that once again blacks and leftist are using the race card blah blah...getting no where. Sometimes I think it is almost a lost cause. coldjoint you might be surprised to know that I'm a gun owner and were it necessary, I wouldn't hesitate to shoot someone. That doesn't mean I think that laws allowing white men to kill teenage boys with impunity while locking up black men for wounding someone has a damn thing to do with freedom in any form so you too can **** yourself. Maybe you and oralloy can do a freedom 69 together. coldjoint you might be surprised to know that I'm a gun owner and were it necessary, I wouldn't hesitate to shoot someone, necessary being the operative word. That doesn't mean I think that laws allowing white men to kill teenage boys with impunity while locking up black men for wounding someone has a damn thing to do with freedom in any form so you too can **** yourself. Maybe you and oralloy can do a freedom 69 together. That's interesting. I was under the impression that you were white. I hear you but I don't want to give up my home because of a bunch of racist stuck on their glory days with their white hoods. I like the country way of life. It is just so hard to fight them now because they have become relatively sophisticated in their methods. I wouldn't credit them with that much intelligence. Let's say instead that the people who manipulate these idiots are getting more sophisticated in their indoctrination techniques. True, but I hope civil rights groups find a way to turn that around. It's absurd that the luxury of having white skin gives him a level of protection against paranoid, gun toting, asshats. But this is something every parent fears, no matter the color of their skin. That word "seem" is key. The Freedom Haters are just making up a bunch of nonsense as part of their latest attack on American freedom. That alone could just be dismissed as their usual silliness. However, the Freedom Haters should be ashamed of themselves for trying to hijack this poor guy's cause.